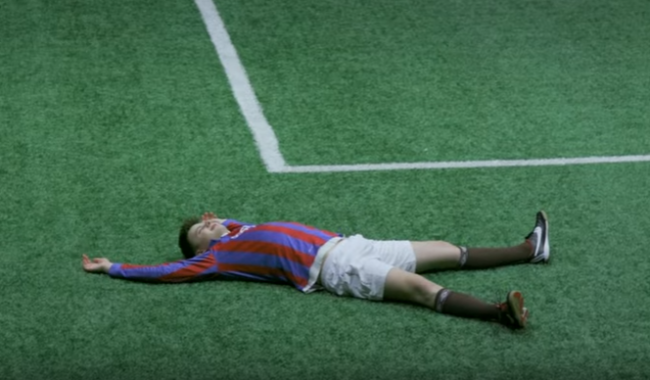 Strictly in the name of science, two Norwegian amateur football teams voluntarily chose to test the effect that alcohol had on their collective abilities. As such, all of the players got absolutely rat-arsed before kick-off, with the decidedly unprofessional pre-game warm-up featuring a heady mix of beer, wine, spirits, junk food, vomit and minor pockets of fighting. After imposing the rule that any goal would be disallowed should the scorer have an insufficient blood alcohol level, the two sides went at it. Looks like fairly standard Sunday League stuff to us. God bless the intrepid pioneers of the Norwegian game, for without them we’d never have known what electro-shock football, virtual reality ‘bird’s eye view’ football, or even what a game pitting 22 pros against 11 amateurs would look like. Why the Palestine shirts though?